Green peas coated in wheat flour with "wasabi" added to the mix. 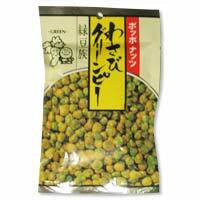 What could be a more perfect match than the flavor of fresh green peas with the spicy taste of wasabi! In Japan, these tangy little morsels are popularly served along with tea or other beverages.